The crimes of drug possession with the intent to sell and drug manufacturing are governed by Massachusetts General Laws Chapter 94C Section 32. These two crimes are governed by the same statute and therefore have the same punishments. A conviction for selling drugs can have harsh consequences on not only you liberty but also your right to operate motor vehicle. Various charges can result in minimum mandatory jail sentences so it is critical that we begin to prepare an effective defense whether its through attacking the stop or search or planning and mapping out a trial strategy. In certain cases the best way to handle the case is to begin to be pro active through drug counseling, drug testing and any other area that may place you in the posture for the court. Distribution of larger quantities of narcotics can lead to an indictment for trafficking. For example, if you have 14 grams of cocaine in your possession, you will be charged with drug trafficking and face a mandatory minimum sentence of three years, even if you only distributed half a gram or less of the amount you possessed. If you have 28 grams of cocaine in your possession, you face a mandatory minimum sentence of five years. There are two elements that the Commonwealth must prove beyond a reasonable doubt in order for someone to be convicted of possession with intent to distribute or drug manufacturing. First, the Commonwealth must prove that the individual knowingly or intentionally manufactured, distributed, dispensed or possessed a controlled substance. This means that, at the very least, it must be proven that the drugs were knowingly in the possession of the individual being charged. Second, in addition to possession, the Commonwealth must prove that the individual had the intent to manufacture, distribute or dispense the drug. This element is the key difference between being charged with simple possession of a controlled substance and possession with intent to distribute a controlled substance. The act of selling is not one of the elements of the crime of possession with the intent to distribute. As mentioned above, it is the intent to manufacture, distribute or dispense the controlled substance that is the crime. Therefore, an individual who is merely holding drugs that he or she plans to share with or give to a friend can be charged with the crime of possession with intent to distribute. An individual can be charged with possession with intent to distribute without actually being caught in the act of distributing as long as it can be proven beyond a reasonable doubt that he or she intended to distribute the controlled substance in the future. 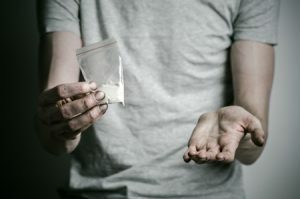 The Commonwealth may use other evidence, such as a large sum of cash in the individual’s possession, to help prove that the individual intended to distribute the controlled substance. Chapter 94C: Section 32. Class A controlled substances; unlawful manufacture, distribution, dispensing or possession with intent to manufacture, etc. (a) Any person who knowingly or intentionally manufactures, distributes, dispenses, or possesses with intent to manufacture, distribute or dispense a controlled substance in Class A of section thirty-one shall be punished by imprisonment in the state prison for not more than ten years or in a jail or house of correction for not more than two and one-half years or by a fine of not less than one thousand nor more than ten thousand dollars, or by both such fine and imprisonment. (b) Any person convicted of violating this section after one or more prior convictions of manufacturing, distributing, dispensing or possessing with the intent to manufacture, distribute, or dispense a controlled substance as defined by section thirty-one of this chapter under this or any prior law of this jurisdiction or of any offense of any other jurisdiction, federal, state, or territorial, which is the same as or necessarily includes the elements of said offense shall be punished by a term of imprisonment in the state prison for not less than five nor more than fifteen years. No sentence imposed under the provisions of this section shall be for less than a mandatory minimum term of imprisonment of five years and a fine of not less than two thousand and five hundred nor more than twenty-five thousand dollars may be imposed but not in lieu of the mandatory minimum five year term of imprisonment, as established herein. Chapter 94C: Section 32A. Class B controlled substances; unlawful manufacture, distribution, dispensing or possession with intent to manufacture, etc. (a) Any person who knowingly or intentionally manufactures, distributes, dispenses, or possesses with intent to manufacture, distribute or dispense a controlled substance in Class B of section thirty-one shall be punished by imprisonment in the state prison for not more than ten years, or in a jail or house of correction for not more than two and one-half years, or by a fine of not less than one thousand nor more than ten thousand dollars, or both such fine and imprisonment. (B) Any person convicted of violating this section after one or more prior convictions of manufacturing, distributing, dispensing, or possessing with the intent to manufacture, distribute or dispense a controlled substance as defined by section thirty-one of this chapter under this or any other prior law of this jurisdiction or of any offense of any other jurisdiction, federal, state, or territorial, which is the same as or necessarily includes the elements of said offense shall be punished by a term of imprisonment in the state prison for not less than three nor more than ten years. No sentence imposed under the provisions of this section shall be for less than a mandatory minimum term of imprisonment of three years and a fine of not less than two thousand and five hundred nor more than twenty-five thousand dollars may be imposed but not in lieu of the mandatory minimum term of imprisonment, as established herein. (c) Any person who knowingly or intentionally manufactures, distributes, dispenses or possesses with intent to manufacture, distribute or dispense phencyclidine or a controlled substance defined in clause (4) of paragraph (a) or in clause (2) of paragraph (c) of class B of section thirty-one shall be punished by a term of imprisonment in the state prison for not less than two and one-half nor more than ten years or by imprisonment in a jail or house of correction for not less than one nor more than two and one-half years. No sentence imposed under the provisions of this section shall be for less than a mandatory minimum term of imprisonment of one year and a fine of not less than one thousand nor more than ten thousand dollars may be imposed but not in lieu of the mandatory minimum one year term of imprisonment, as established herein. (d) Any person convicted of violating the provisions of subsection (c) after one or more prior convictions of manufacturing, distributing, dispensing or possessing with the intent to manufacture, distribute, or dispense a controlled substance, as defined in section thirty-one or of any offense of any other jurisdiction, either federal, state or territorial, which is the same as or necessarily includes, the elements of said offense, shall be punished by a term of imprisonment in the state prison for not less than five nor more than fifteen years and a fine of not less than two thousand five hundred nor more than twenty-five thousand dollars may be imposed but not in lieu of the mandatory minimum term of imprisonment, as established herein. Chapter 94C: Section 32B. Class C controlled substances; unlawful manufacturer, distribution, dispensing or possession with intent to manufacture, etc. (a) Any person who knowingly or intentionally manufactures, distributes, dispenses, or possesses with intent to manufacture, distribute, or dispense a controlled substance in Class C of section thirty-one shall be imprisoned in state prison for not more than five years or in a jail or house of correction for not more than two and one-half years, or by a fine of not less than five hundred nor more than five thousand dollars, or both such fine and imprisonment. (b) Any person convicted of violating this section after one or more prior convictions of manufacturing, distributing, dispensing or possessing with the intent to manufacture, distribute or dispense a controlled substance as defined by section thirty-one under this or any prior law of this jurisdiction or of any offense of any other jurisdiction, federal, state, or territorial, which is the same as or necessarily includes the elements of said offense shall be punished by a term of imprisonment in the state prison for not less than two and one-half nor more than ten years, or by imprisonment in a jail or house of correction for not less than two nor more than two and one-half years. No sentence imposed under the provisions of this section shall be for less than a mandatory minimum term of imprisonment of two years and a fine of not less than one thousand nor more than ten thousand dollars may be imposed, but not in lieu of the mandatory minimum term of imprisonment, as established herein. Chapter 94C: Section 32C. Class D controlled substances; unlawful manufacture, distribution, dispensing, cultivation or possession with intent to manufacture, etc. (a) Any person who knowingly or intentionally manufactures, distributes, dispenses or cultivates, or possesses with intent to manufacture, distribute, dispense or cultivate a controlled substance in Class D of section thirty-one shall be imprisoned in a jail or house of correction for not more than two years or by a fine of not less than five hundred nor more than five thousand dollars, or both such fine and imprisonment. (b) Any person convicted of violating this section after one or more prior convictions of manufacturing, distributing,dispensing, cultivating or possessing with intent to manufacture, distribute, dispense or cultivate a controlled substance as defined by section thirty-one under this or any prior law of this jurisdiction or of any offense of any other jurisdiction, federal, state, or territorial, which is the same as or necessarily includes the elements of said offense shall be punished by a term of imprisonment in a jail or house of correction for not less than one nor more than two and one-half years, or by a fine of not less than one thousand nor more than ten thousand dollars, or both such fine and imprisonment. Chapter 94C: Section 32D. Class E controlled substances; unlawful manufacture, distribution, dispensing, or possession with intent to manufacture, etc. (a) Any person who knowingly or intentionally manufactures, distributes, dispenses or possesses with intent to manufacture, distribute, or dispense a controlled substance in Class E of section thirty-one shall be imprisoned in a jail or house of correction for not more than nine months, or by a fine of not less than two hundred and fifty nor more than two thousand and five hundred dollars, or both such fine and imprisonment. (b) Any person convicted of violating this section after one or more prior convictions of manufacturing, distributing, dispensing or possessing with the intent to manufacture, distribute or dispense a controlled substance as defined by section thirty-one under this or any prior law of this jurisdiction or of any offense of any other jurisdiction, federal, state, or territorial which is the same as or necessarily includes the elements of said offense shall be punished by a term of imprisonment in a jail or house of correction for not more than one and one-half years, or by a fine of not less than five hundred nor more than five thousand dollars, or both such fine and imprisonment.